I stumbled across my current favorite example of how almost everything you’ve been told about Auburn history is wrong while doing some digging for an Auburn Magazine story on the history of Jordan-Hare Stadium, this year being its 75th anniversary and all (I mean, I guess it is… who knows…). It’s a favorite because it’s such a basic statistical building block: What was Auburn Stadium’s original, day-it-opened capacity? Well, it depends on which website, magazine, media guide or Auburn history book you’re looking at, but almost all of them (except this one—respect) are wrong. 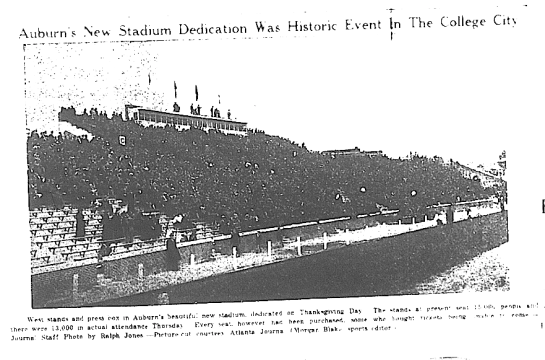 The current copy-and-paste consensus is that the stadium could hold 7,500 people on Nov. 30, 1939, the day it was dedicated. 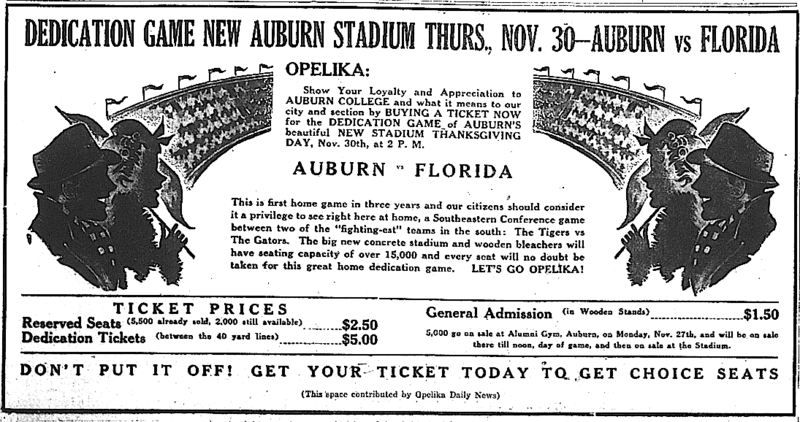 That jives with the attendance figures for the Auburn-Florida game that day that a reminiscing Jeff Beard, former Auburn Athletic Director, swore to 50 years later: 7,290. So why did Auburn football Coach Jack Meagher, in a thanks-for-coming note to students the following week, state that the official attendance was 11,095? Why did most newspaper accounts estimate the first real crowd to be between 12,000-14,000? Do the math provided in the the 2014 issues of Auburn Football Illustrated and you come up with the (incorrect) number Jeff Beard insisted was the attendance at the first game. You’ll also think that the first game in the stadium was the 1939 season finale, but that’s not right, either. 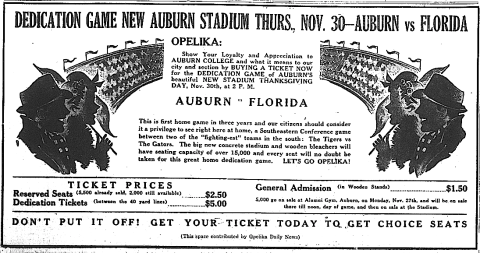 Auburn played Tennessee nine days later. Somewhere along the way, when people started talking about “the stadium”, what they really meant were the west stands. 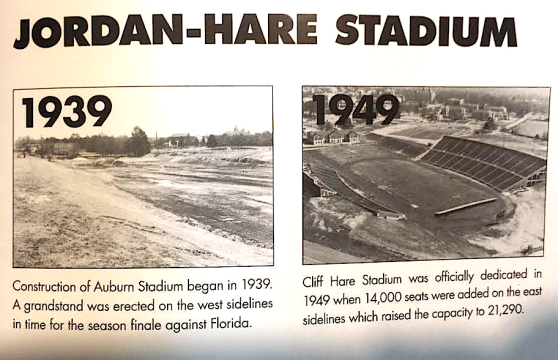 When you ponder Jordan-Hare’s growth, you ponder in terms of permanence. 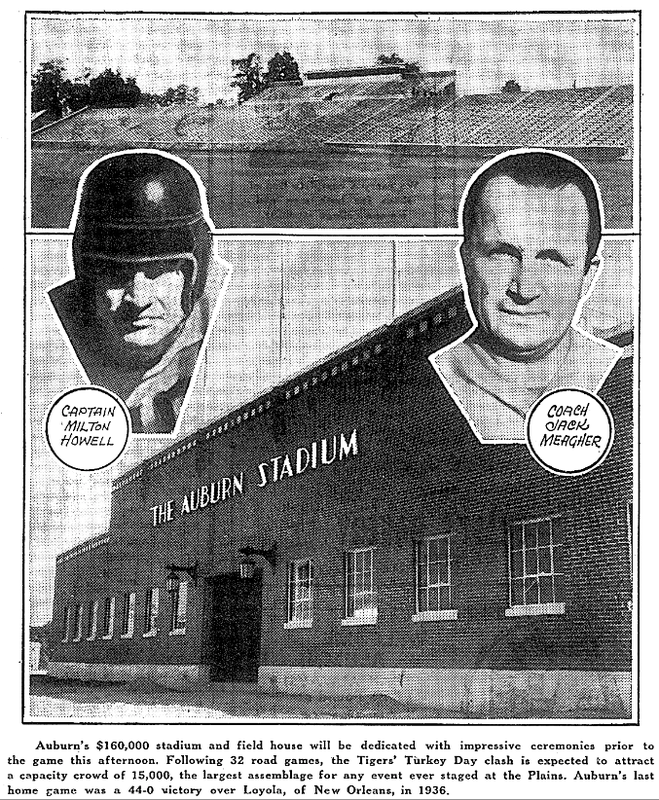 And the west stands were the first permanent portion of the stadium. They were concrete. They were the anchor. They weren’t going anywhere. Soon forgotten, however—Beard was telling everyone asking him for stadium stories for the 50th anniversary that they were only added a year or so later—were the large wooden stands erected on the east side of the field. Ditto the temporary bleachers behind each end zone. In his letter, Meagher said he was happy with the turn out even though 11,095 “wasn’t a full house” (even though every available ticket had been purchased to help fund the thing). A full house was 15,000. And it stayed that way for a decade. In 1949, 13,000-ish seats were added to the east side, making a grand total of 21,500-ish. Wait—how do you add 13,000-ish to 15,000 and get 21,500-ish? You get out your bulldozer and subtract the temporary-for-ten-whole-years wooden stands, and then you add 13,000-ish. And from what I can tell, therein lies the lookin’-back confusion. In 1989, former Auburn Athletic Director Jeff Beard said he was positive there were only 7,290 people at the first game in Auburn Stadium because “that’s how many tickets we had printed”. That’s how many RESERVED tickets they had printed. He forgot about the special, extra-expensive, Buy If You Love Auburn souvenir tickets for seats between the 40-yard lines, and the 5,000 general admission tickets that went on sale the Monday before the game. I mean, it’s easy to just do the math and go with it when you’re dealing with sepia-toned stats that you know the people reading the press release you’re writing don’t really care about, nor that anyone in 2014 can really relate to anyway. So just subtract 13,000-ish seats from 21,500-ish and carry the temporary end zone bleachers and hit enter. Original Capacity: 7,500—right on your calculator, wrong in reality. Sure, those new 13,000-ish seats comprised a new, permanent east side stands made of stuff that wouldn’t warp in rain or anything. But the people they sat were no more real than those that had been paying to watch Auburn games (what few there were) from the same spot for ten years. So congrats to the at least 3,805 forgotten Auburn souls at that first game on being written back into existence! $1.50 for General Admission?! Forget it. I’ll just stay home and watch it on the radio.